"All labor yields to Caesar's Amphitheater." Begun by Vespasian in AD 70, the Colosseum (Amphitheatrum Flavium) was completed and dedicated by his son Titus in AD 80 with games that lasted one-hundred days. There are four arcaded stories, the first three each have eighty arches, framed respectively by engaged Doric, Ionic and Corinthian columns. Seventy-six of these arches are numbered to assist spectators in finding their assigned seats. An attic, which serves as the fourth story, has Corinthian pilasters framing bays that alternate between windows and large decorative shields of gilded bronze, which had been added by Domitian, the brother of Titus. Above them, projecting corbels supported masts that passed through the crowning entabulature of the attice story. It was from these tall wooden masts that a sheltering awning was suspended. On the major axis were the Porta Triumphalis, through which the gladiators paraded, and the Porta Libitinensis, named after the goddess of funerals, through which the dead and wounded were carried; on the minor axis, the entrances reserved for the emperor and for the magistrates and Vestal Virgins. 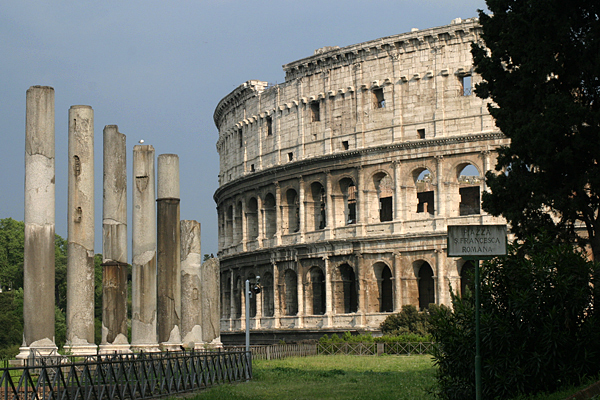 The bollards are set in regular intervals around the perimeter of the Colosseum on an axis with the columns themselves. This would suggest that originally there were eighty stones. Some authorities have argued that there were twice that number, although this does not seem to be supported by the number that can be counted on the ground. Coincidentally, one hundred sixty is the number calculated by dividing the perimeter of the amphitheater (189 x 156 meters = 545) by the distance between the bollards themselves (3.4 meters). Suetonius relates that, sometimes, when the sun was hottest, Caligula would have the awning of the Colosseum drawn back and give orders that no-one be allowed to leave (XXVI.5). And Lucretius speaks of the canvas stretched over a theater tearing and flapping wildly between the poles, sounding like paper being torn or the crack of thunder (De Rerum Natura, VI.110). Martial, too, mentions the billowing awning in Pompey's theater (XXI.6; also Propertius, IV.1.15) and the umbraculum or umbella (from umbra, shade), a parasol used as protection against the sun and wind (XIV.28). To protect spectators from the hot Mediterranean sun, the seating area of the Colosseum, as well as part of the arena, were screened by an awning. This velarium consisted of long fabric strips (possibly of linen or wool), connected together and suspended from ropes that hung from 240 masts set in sockets around the cornice of the amphitheater. A special detachment (vexillatio) of marines stationed nearby raised and lowered these awnings like sails on a ship. 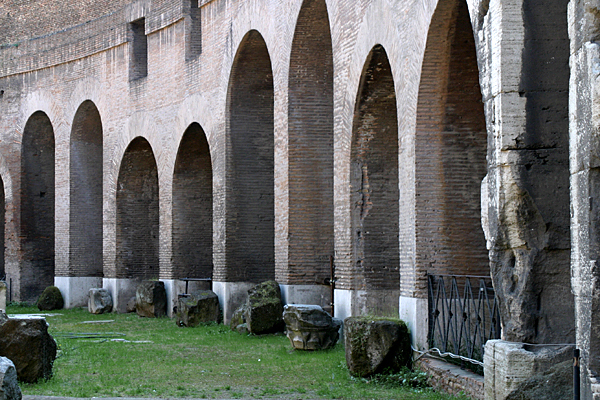 One can imagine its appearance from the awning that covered the ampitheater of Nero in the Campus Martius. Dyed an azure color to imitate the heavens, it was spangled with stars (Pliny, Natural History, XIX.24). It has been suggested that the lines from which the awnings were suspended were secured to a series of travertine bollards that circumscribed the amphitheater. But, if these lines were braced by posts set at pavement level, it is not clear why they are on the same axis as the engaged columns, whereas the sockets and corbels supporting the masts are set between the columns, nor how all the masts were supported. Too, the foundation of the bollards in the ground are too shallow to have supported the tension of the lines. 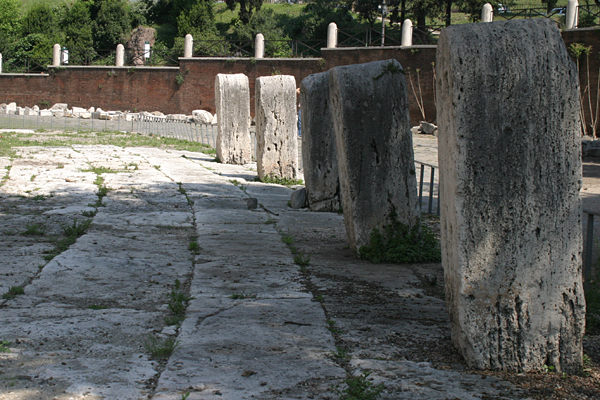 More likely, these stanchions were part of a system of barriers to manage the crowd and limit access to the elliptical piazza that surrounded the amphitheater. Five posts still survive in place. Although barely visible in this photo, these cippi or boundary stones are pierced on the side facing the Colosseum. Four shallow rectangular sockets cut in two pairs, one set over the other, presumably secured bars or chains linking the stones, as did the hole on the top of each bollard, which held a ring through which a chain was passed. In such a way, the paved area around the amphitheater could be cordoned off as a pedestrian zone. The seating of fifty-thousand potentially unruly spectators was handled by a series of ambulatory corridors. They provided orderly access to the seating (cavea), which was divided by aisles into four successive tiers, each reserved by social class. Stairs (vomitoria) further separated these sections into wedges (cunei). Nearest the arena was the podium, which was reserved for senators and other magistrates. The equestrian order sat behind, while women were relegated to wooden seats in the upper-most tier beneath the portico. 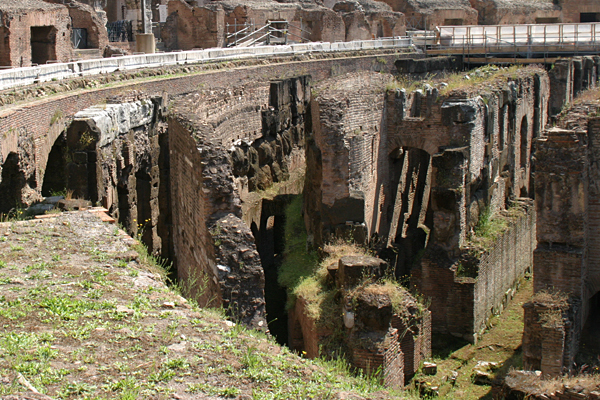 Beneath the wooden floor of the arena, which was covered with sand (arena) and from which its name is taken, was an elaborate substructure of service corridors, cages for wild animals, ramps, and mechanical lifts added by Domitian. 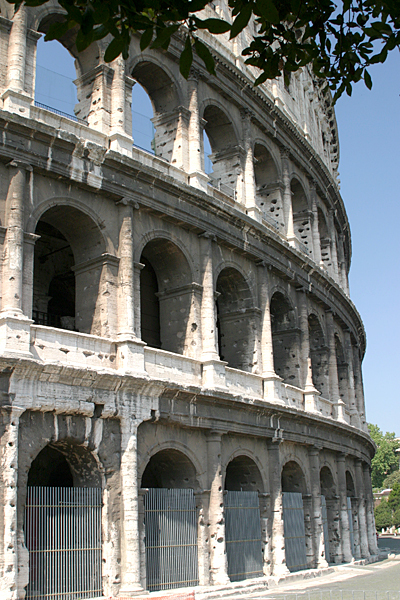 References: The Colosseum (2000) edited by Ada Gabucci; The Story of the Roman Amphitheatre (2000) by D. L. Bomgardner. See also the Colosseum as a venue for gladiatorial games.